The day after we visited the Killing Fields memorial and Tuol Seng, this young monk called by our hostel as we were having breakfast. Unprompted, BigB jumped from his seat to give alms and say a prayer. I think it was his way of responding to what he’d seen the day before. 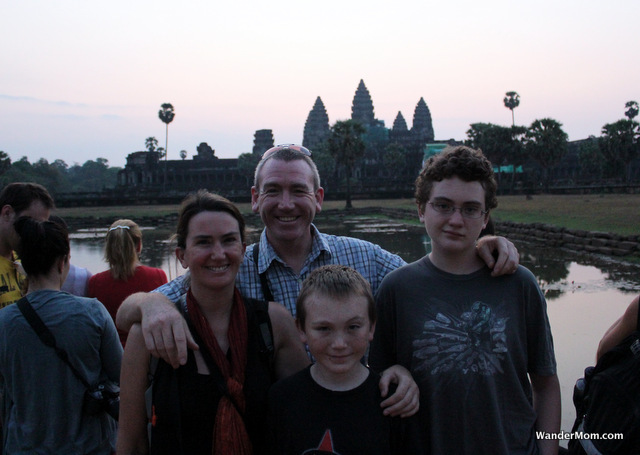 This entry was posted in Cambodia and tagged Cambodia, Photo Friday on January 11, 2013 by wandermom. This post is part of a series called Itineraries. In this series I’ll document the itinerary which we used when visiting a country in summary. It was easy to find a coach from Ho Chi Minh City to Phnom Penh since this is common, well-traveled path for locals and tourists. You see bus companies advertising services all over central HCMC and in hostels/hotels. We picked a reasonable-looking operator and bought tickets the day before for a mid-morning departure. The bus ride is an easy six hours. We paid ~$15 each for seats on an air-conditioned coach (and the AC worked!). The border crossing was painless: get off the bus, line up, show your passport, get back on the bus, carry on. Even when you travel for an extended period (a year for us) and you think you’re jaded and every temple and castle starts to look the same, you can still have unforgettable days. This was one of those. We visited the Killing Fields memorial and the Tuol Seng prison. We took a private tour at the Killing Fields. Half way through we stood at a tree and our guide explained that infants were killed here by having their heads bashed against the sturdy trunk to save bullets. The ground felt like it was going to give way from under me. My stomach lurched. BigB clutched on to me – many months later he confessed that at that moment he just stopped listening, his 10-year-old mind couldn’t process the horror. 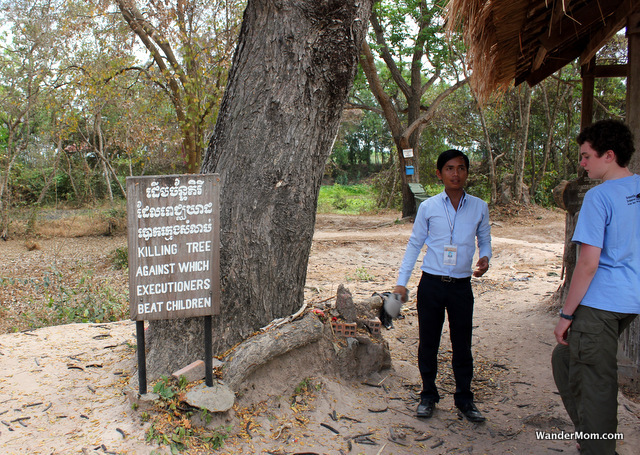 We went back into Phnom Penh proper to visit Tuol Seng, the school that the Khmer Rouge converted into a prison. I thought of my friend Pam who’d told me that she sobbed on the street outside this place. Maybe it was because I was still wrapping my head around the sights of the Killing Fields but I walked through Tuol Seng in a bit of a daze. CAM and BigB checked out completely. 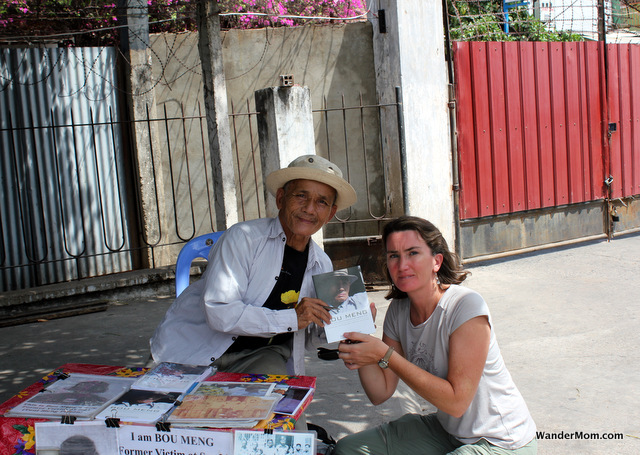 And then outside we met Bou Meng, one of the only survivors of this prison. He told us his story, we bought his book. He was positively cheerful talking to us. Then my tears came. I felt ashamed. I remember watching The Killing Fields and reading about the Khmer Rouge. I couldn’t plead ignorance of what had happened here but I, like most of the rest of the world, moved on and stopped paying attention – even though the Khmer Rouge was still in existence until 1999! Let’s just say that a day of doing nothing more challenging than looking out a bus window was very welcome after what we’d seen on the previous day. In Siam Reap we stayed at the budget luxury Central Boutique Angkor through which we booked an Angkor Wat tour – starting at sunrise. After the obligatory photo moment we spent hours walking through temples, learning about different kinds of temples, different Khmer eras and generally scrambling about the vast complex. The size was a bonus for keeping our boys engaged but they were templed-out at least an hour before we were. Like many other huge tourist sites worldwide this is one where I think budgeting for a multi-day visit (in money and time) is a worthwhile investment. Over the next two days we lazed by the pool, caught up on schoolwork (for the kids) and explored Siam Reap. Murph and CAM did a half-day Khmer cooking school at one of the restaurants in Siam Reap’s central tourist area. Murph and I also got to go to one of the more unusual classical music concerts we’ve ever attended: a cello concert given by Dr. Beat Richner (Dr. Beatocello) at the Kantha Bopha hospital in Siam Reap. As well as some great music we learned about his work in Cambodia and the dire state of public health in this impoverished country. 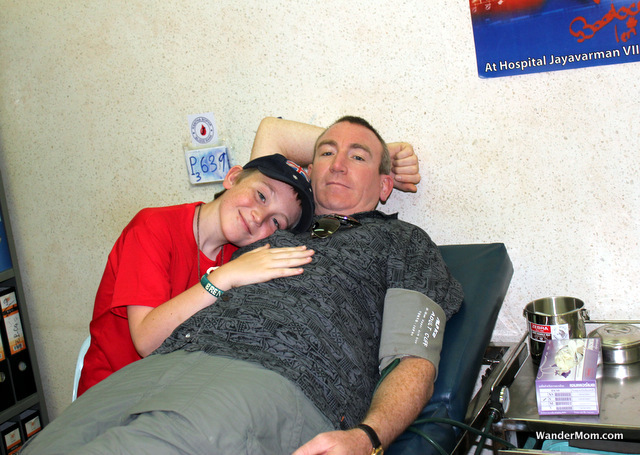 Dr. Beatocello impressed us so much that the next morning we returned to the hospital to donate blood – ironic really since as people who lived in Ireland in the 1980s we can’t donate blood at home in the U.S. In the afternoon we were picked up by some people from American Assistance for Cambodia a charity that funds the building and operation of schools in Cambodia for a long, bumpy ride north towards the Thai border. There’s a full trip report of our visit to the Passports school and the opening ceremony here. Siam Reap to Poipet, on the western Thai border is a pretty straight run on pretty well-maintained roads. The border crossing was also straightforward. We hadn’t booked onward transport but were savvy enough to know to walk away from the touts hanging around at the exit checkpoint. A little further in we stopped at a cafe and took our time before selecting a minibus in which to travel onward. Even with that we ended up on a overcrowded bus – the extra passengers added after we had paid and were on board. This is something which, it seems, is almost impossible to avoid when traveling independently in Thailand. 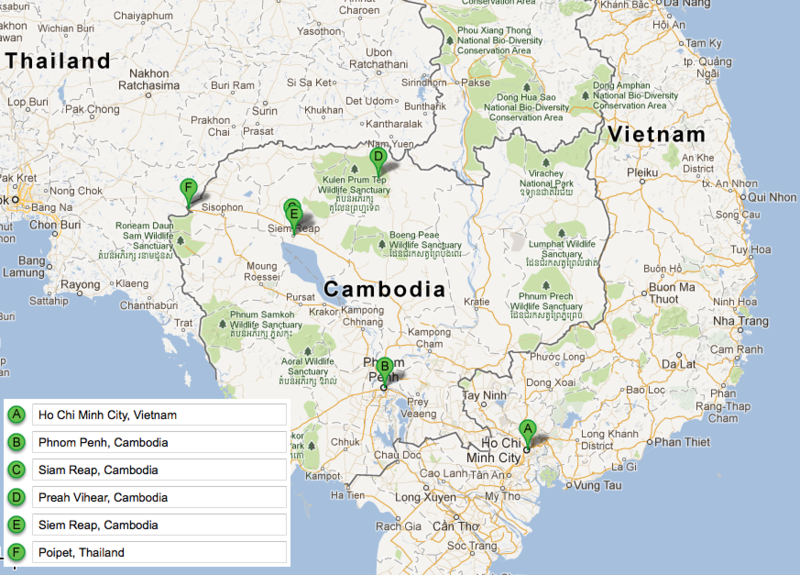 This entry was posted in Cambodia and tagged 2011, Cambodia, Itineraries on January 7, 2013 by wandermom. This is a photo from the Opening Ceremony of the Passports School, in Preah Vihear Cambodia. 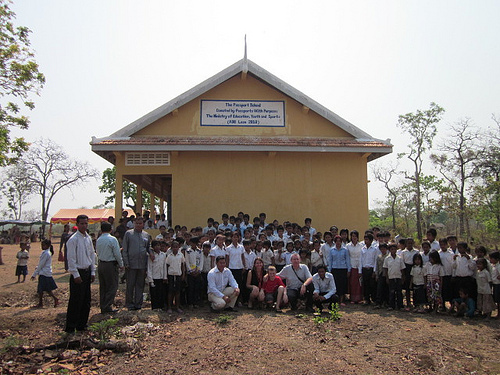 Funds to build this school were raised through Passports with Purpose in 2009. Standing in front of 100+ kids, most of whom came from homes with no running water, many of whom are lucky to have survived early childhood, and realizing that by building this school, my friends and I had just given each and every one of them a huge push forward towards a better future was something I didn’t expect but which I will never forget. I’ve come home to Seattle even more passionate about the education of women and children in the developing world but optimistic that this is a problem where I, and you, can make a positive impact. There are great organizations already there, working with communities building schools and libraries and teaching. Fundraising for these organizations is the single best thing we can do to help them continue their great work. – 86% of Zambians live on less than $2 a day. – 34% of children do not attend primary school. – 76% of children do not attend secondary school. The (virtual) Passports with Purpose team works to choose projects that are community-supported. These libraries will be built next to existing primary school buildings with the communities donating 35% of the cost of building in volunteer hours and donated materials. This involvement is a better guarantee of community ownership and government of the facilities after the construction project has completed. RoomToRead includes teacher training in the project scope – and books, lots of age-appropriate books. At Passports with Purpose we like to encourage donations by offering prizes. We have prizes. Lots of prizes. If you want to win a tour in Thailand, a week in Maui, an Xbox Kinect (with games and an Xbox Live subscription), and overnight stays a bunch of fancy hotels in cities all over the US, check out the prizes. For each $10 you donate, you get an entry into the free prize drawing of your choice. This post was a little longer than I intended for a photo post, but so it goes. Head on over to DeliciousBaby for more travel-themed Friday photo fun. This entry was posted in Passports with Purpose and tagged Cambodia, Passports School, Passports With Purpose, Photo Friday on December 9, 2011 by wandermom. The Central Boutique Angkor Hotel was a gem. We didn’t discover it ourselves, it was recommended to us by fellow travelers we met in Ho Chi Minh City. 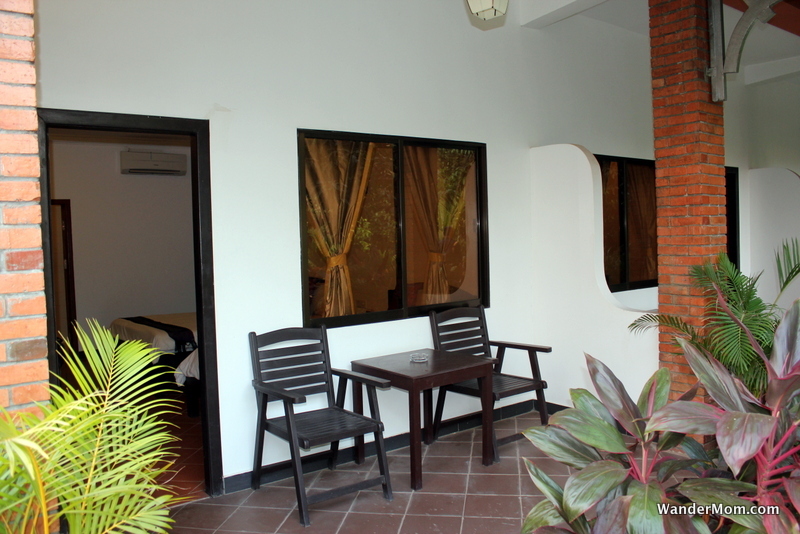 They raved about the relative comfort and luxury of this boutique property on the outskirts of Siam Reap. I admit, initially I was tentative since I was nervous that anywhere with such great reviews would be way out of our $15-per-person-per-day budget. We had just come from a three-day cycle tour of the Mekong Delta where we got utterly rained out and stayed in some very odd homestay properties. Budget aside, the thought of a pool and spacious rooms with crisp clean sheets and western-style bathrooms was very, very appealing. I sent off a booking enquiry on the hotel’s website. The hotel has single, double and triple rooms with or without pool views. They also have interconnecting double rooms for families. For the princely sum of US$70 per night we stayed in one of these. That’s $17 each for two full rooms. Each room actually sleeps three (one king, one single) but that just meant that my boys didn’t need to share a bed. We felt like kings. (The room rate also includes a generous breakfast). 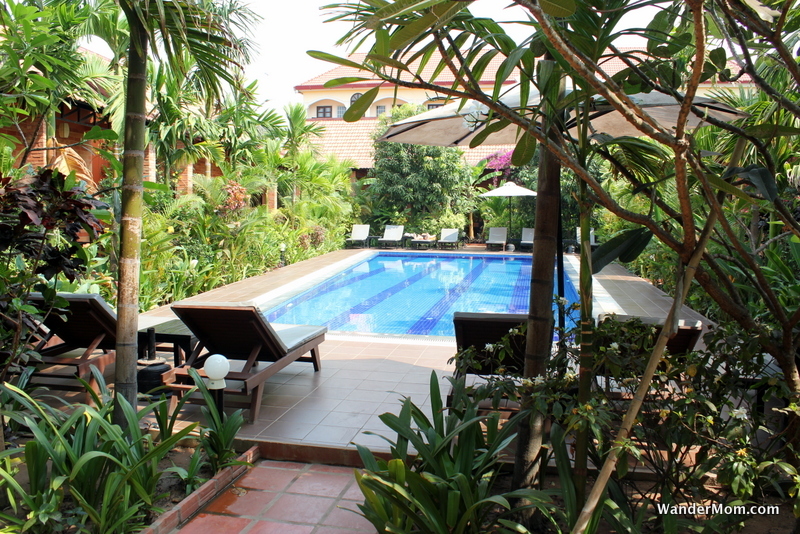 The Central Boutique Angkor hotel is a 5-minute tuk-tuk ride from downtown Siam Reap. It’s in a quiet neighborhood with a couple of backpacker hostels and the French-style Sala Bai Hospitality School nearby. The property is down an unpaved side street – which might make you a little nervous – but once you’re through the gated entrance, the peaceful garden setting seems to emanate calm. The rooms are spacious. The linens literally gleam. There are some Cambodian decorative accents but everything is stylishly understated. Rooms have TVs with cable, free wifi and coffee-making facilities. The bathrooms are a dream. OK, maybe they’re just a dream if you’re coming from budget-backpacker-land. The large tiled bathroom has an American-style tub and shower. There’s a hair-dryer, refrigerator, safe deposit box and (whoo-hoo!) bathrobes. The friendly owners live on-site with their vivacious little girl. We found the staff welcoming and helpful for everything from ordering food to booking onward transportation. There’s a small restaurant on site where you can get Khmer and Western food. Our kids ate there every evening and we felt comfortable enough with the hotel overall to leave them at the hotel while we went out for a date night dinner. The pool was where we lounged after our dawn visit to Angor Wat and all the next day as we took a break from our travels just to enjoy this peaceful garden oasis. If you are visiting with very young children, be aware that the hotel does not have any pool guards or alarms but the hotel does have baby-sitting services on request. The Central Boutique Angkor Hotel provides pick-up services from the airport (and the bus station if you’re traveling cheapo-style like we were). The drivers will also do tours to Angkor Wat. There are a lot of hotels in Siam Reap but this one is a great base for visiting this area or just relaxing between temple rambles. 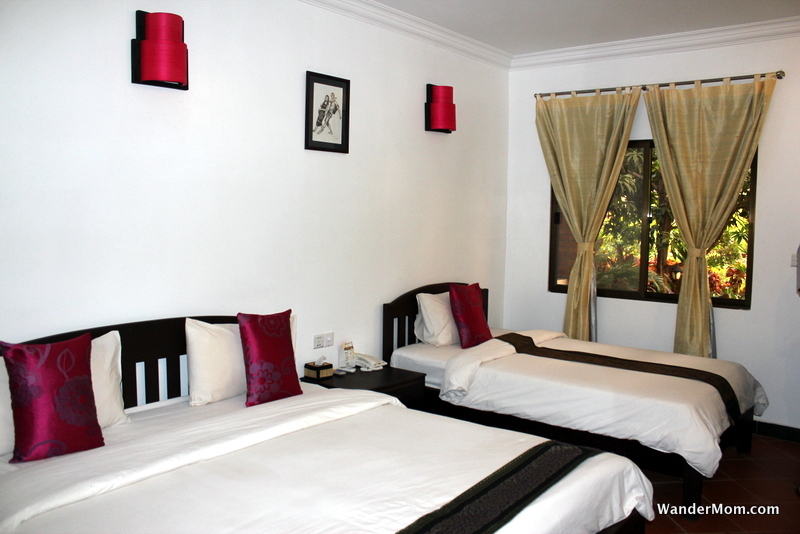 This entry was posted in Advice And Resources and tagged Accommodation, Cambodia, Siam Reap, Siam Reap Hotel on November 21, 2011 by wandermom.